New boys David Edgar and Fraser Kerr and their dominant display took centre stage at Barnet on Saturday - but the role of the duo alongside them cannot be overlooked. Without Peter Kioso - an outside contender for player of the year - to the right and the increasingly impressive Myles Anderson to the left, Kerr and Edgar would have been a whole lot more busy than they were. Myles Anderson (right) with manager Craig Hignett. This is not something lost on Pools' assistant manager Ged McNamee. In fact, the Super 6 Stadium No 2 has been full of praise for Anderson in particular. 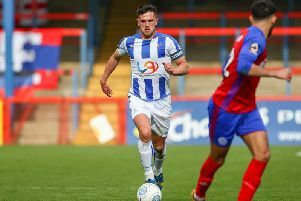 McNamee, like manager Craig Hignett, sees Anderson as a proper, old style central defender who puts his head where it hurts, as well as being a crucial cog in Pools' defensive machine. "He puts his head in where it hurts, his body on the line. That's what he's about," said McNamee. "Although we put the emphasis on attacking, and we have some good attacking players who want to run forward, you have to shut the back door and ensure you have a solid base. Myles has helped give us that." With Edgar away on international duty with Canada and Danny Amos also with Northern Ireland under-21s, options are again a little limited in the back four. Anderson could well continue at left-back with Aaron Cunningham coming in, or we could see Mark Kitching return to the starting XI, which would see the former Blackburn and Aberdeen defender slot back into the centre. While McNamee is giving nothing away on his manager's plans, he does know the club have a duty of care towards the youth in the squad, including the likes of Cunningham and Kioso. "It is such a demanding league," he said. "You have to know when to put young players in, when to take them out. "It is not the fitness aspect, it is more the mental. "Mentally it can be a challenge for young players to deal with the approach at this level, the directness. The intensity is also something that has to be considered. "Some of the experienced players feel it, so it is no shock the young lads feel it, too."